7th February 2008. 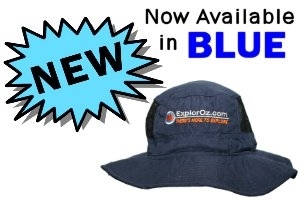 In this Issue: 30% discount off all Audio Book titles in stock; ExplorOz Slouch Hat now available in Blue; Photo Uploading in Forum; Members Home Page face-lift; Sellers experiencing fast sales in ExplorOz classifieds. New look newsletter - but it's still us! Hopefully you'll find it just as informative and inspiring as usual. Let us know your feedback or special requests. Strictly offered on a "first come first served" basis. 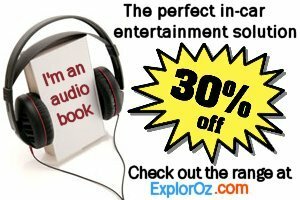 Look for the specially marked "Stock Clearance" Audio Book titles to get this discount. Photos can now be uploaded directly from your computer to a Forum post. Note that this feature is only available to Members. The Members Home Page (received as a bonus when you become a Member) has had a face-lift! Members will enjoy the extra features and improved Member Gallery section featuring an improved image upload tool. You wouldn't expect us to be proud of diminishing classified listings in our Trader but that's exactly what's happening! The reason for this quirk, is that items are currently being sold so quickly that demand is outstripping supply! So, this simply means one thing - if you've got something to sell, now's the ideal time to place a Trader Ad. Our newsletter is distributed to 28,200 subscribers on a fortnightly basis.